Two really unusual and special things happened today. 1. I took a picture of a pineapple growing next to my hut, and then the lady came a picked it after I already had my picture. I have never seen an actual pineapple plant. 2. A rainbow formed around the sun in a large concentric circle. It was like there was a rainbow circling the sun. I was reading my book on the beach laying on my back, holding my book above my face and using the book to block the sun I noticed there was a circle around the sun, now looking at the sun is not easy, but I kept the book blocking the sun and for sure there was a rainbow around the sun. I went and asked some girls next to me if that was for sure what I was looking at, because my eyes were getting a little sun dazed. They agreed and I was sitting wishing I had an expensive camera that would allow me to take a photo of the sun, I went on back to my bungalow and by the time I was there the rainbow was gone, but I did then take the photo of the pineapple. If this is true then I am sitting on a pot of gold! 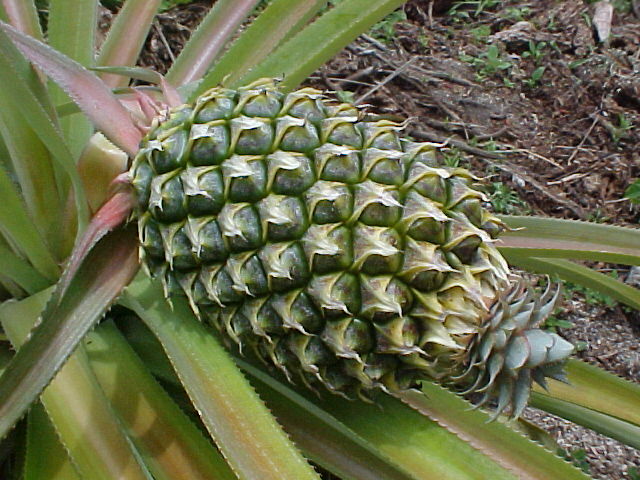 Pineapple growing next to my hut on Koh Pha Ngan, Island Thailand. Note that Koh means Island so redundant in a way. I eat too much and I like potato chips, French Fries and oily products, plus I am on a bus a lot that stops at places that sells junk foods, so I have realized that a good snack food for the bus is a can of tuna. They have come out with a pull tab top and if you do not know, you want to get the type with water and not oil or it defeats the purpose. One can is about all I can eat or I will get sick there is something in tuna that is overwhelming to the system, but as far as protein goes this is one of the best. I received an email from Relio.com my hosting company and they wanted me to check my blog, I tried to publish my blog but still it will not post on my webpage. I am really itching, I am not sure what goes on in Thailand but after every shower I itch until completely dried. I need to leave Thailand on or before the 28th of August so that is my deadline in a way for when I either leave for Penang, Malaysia or for the Philippines, I am not quite sure because I am wanting to pick up my tent also in Khon Kaen and this is rushing things. I could just fly to Penang for a week on the beach to check out this beach as my friend Steven says it is one of the best. I just received an email from a Susan saying telling me about a great beach in Egypt on the Gulf of Aqaba, just below Israel and Jordan. I am trying to make a list of possible good beaches or great beaches ot visit. There seems to be too much of my time being used by my day to day operations and not enough of my time being used to think or just plain think about anything I want to think about. I am not happy when I must dwell on small issues that are more or less just normal living problems. I am waiting for a tent to arrive and my ATM card is being sent from the USA, both of these waiting problems are annoying as I cannot control or predict when they will happen. Time is a funny thing, I have lots of spare time, but I also am always too busy. I am not really busy, but I cannot every feel like I have finished all my projects as there is always another project, so I am always working on something that I have not completed. I sometimes get very annoyed at computers because there always seems to be problems with a computer, or something is astray, never a moment when there is not some little glitch. I have two computers with me and I think maybe that is the only way I can keep one computer working all the time, or when one is not working the other can be working. I am in Koh Pha Ngan and maybe the same problem is happening again. I am in the same Black and White bungalows and the same sort of electrical problems I had the last time I was here have started, I am going to move out of here because I am afraid there is some form of short or jump or something I am not sure of that is causing this problem. I only have 2 hours of time to type. But in other annoyances or problems my blog cannot be updated because my hosting company has put on a firewall. I tell you, if it is not one thing it is another. Note that one reason I just returned to Bangkok was to get the computer I am on presently fixed, it is under warranty while the other one is not anymore. Aagh! Chris told me about a 40 Meg USB hard external hard drive, I am thinking about going to Panthip in Bangkok and seeing about buying one of these, as a 40 Megs would be a great backup. I am sitting at the ferry station or one of the ferry stations that goes to either Koh Samui or Koh Pha Ngan after a 14 hour trip to get to this point. I left last night at 6:00 pm on an overnight air conditioned bus to Koh Phan Ngan with a ticket I purchased from the Peachy Guesthouse for 300 Baht, that is somewhere around 50 Cents USA per hour of bus time. I have all these little ways of evaluating the cost or value of transportation, like about 600 dollars U.S. should buy a ticket to about any spot on the planet from your present location one-way. One dollar an hour of travel time is a good price to pay for land transportation, while in the USA or Europe this can be 10 times that amount. Japanese people with their new color haired styles. Italians girls that tell they are from England. An experienced oriental ex-pat that seems to be comfortable. I scuba instructor from Koh Phi Phi that is tired of tourist. And of course but not least the management that will take a ticket away and say follow me or sit here, but not explain, so all in all just normal life. I have never found in the underdeveloped, developing, third world, countries that there was a correlation between the ticket and what happens, so no point in worrying except when you start to go the wrong direction as of East, West, South or North, if I am going the correct direction I do not worry much. I have not been able to blog for the last few days because my Hosting company has installed a firewall to keep viruses out of the system and also keeps me from leaving, not that is a wall, not what I think they wanted, but it is a wall or firewall.